Les Ferron is one of those noir novel protagonists who has a double life. In one of them he’s a pure heel, a strongarm enforcer for a loan shark in New York City who accidentally kills one of the poor losers he’s supposed to be leaning on. That gives Ferron’s boss something he can hold over his head from then on, and Ferron doesn’t like that. So he creates a new identity and launches a plan to get rich and start a new life. Actually, he reclaims his old life, using his real name Paul Parrish and some of his background as a schoolteacher and the son of an itinerant preacher to set himself up part-time as a traveling Bible salesman in the Catskills. He even meets a beautiful, innocent young farmer’s daughter and falls for her, although not so hard that he won’t swindle her father out of his farm and take off with the loot he can get from the deal. In order to do that, he’ll have to marry the girl and then abandon her when the time is right. The only potential hitch is that he has a girlfriend as Les Ferron in New York, and she’s the hard-nosed jealous type who won’t take kindly to being left behind. But when Ferron is satisfied his plan will work, he puts it in motion—and that means killing his loan shark boss and making sure “Les Ferron” disappears forever. Too bad for Ferron, because not only is this a noir novel, it’s a noir novel written by one of the best plotters in the business, Day Keene. SLEEP WITH THE DEVIL takes its time setting everything up, but once the first big plot twist steps through a hotel room doorway, it’s just one damned thing after another for Ferron, right up until the gut punch ending. 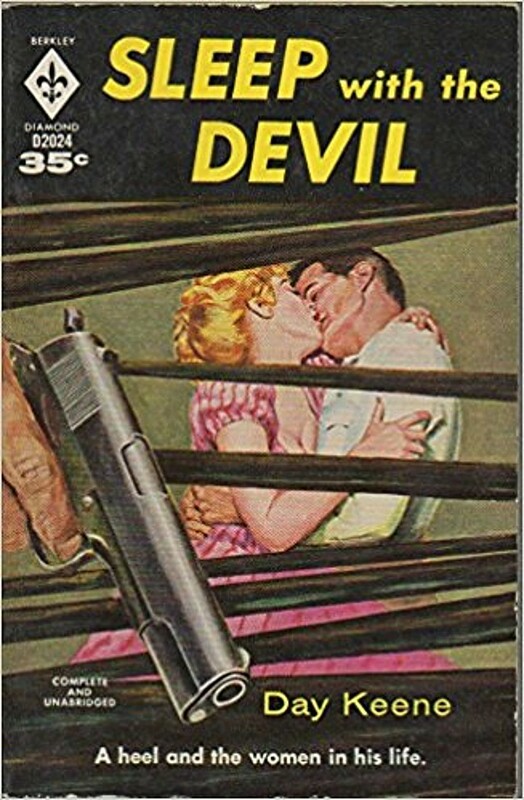 This novel was published originally by Lion Books in 1954 and later reprinted by Berkley, Macfadden-Bartell, and ultimately Stark House as part of a triple volume with two other Day Keene novels, WAKE UP TO MURDER and JOY HOUSE. I’ve really enjoyed everything I’ve read by Day Keene, and SLEEP WITH THE DEVIL is no exception. 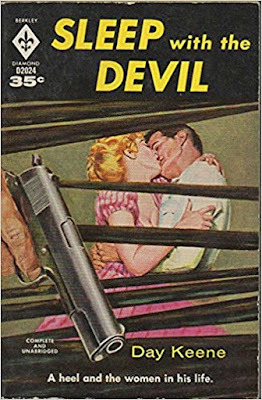 Harry Whittington was probably the only one of the iconic Fifties hardboiled/noir writers who could out-plot Keene, and if his prose never rises to the level of John D. MacDonald and Charles Williams, it’s still pretty darned good. 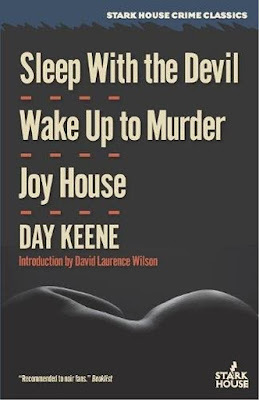 Day Keene has become one of my favorite writers, and this book is a fine example of his work. Highly recommended. I read this one a few months ago, along with another Day Keene novel called PAYOLA, an attempt at a series of detective novels starring Johnny Aloha. 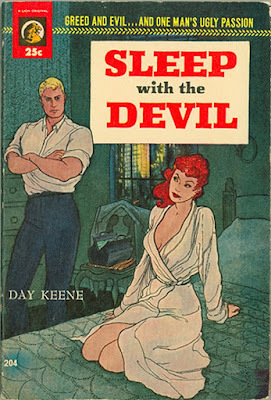 SLEEP WITH THE DEVIL is my favorite Day Keene novel so far. It had a relentless drive to it that the best noir novels have. Ferron is completely ruthless and you keep reading it knowing that everything will eventually blow up in his face. I loved it. STARK HOUSE is doing a fabulous job returning books like SLEEP WITH THE DEVIL back to print for a new audience. Day Keene is truly an underrated writer. Agree, STARK HOUSE is great and Day Keene deserves more credit. Ramble House also reprinted quite a few Day Keene stories. Gunard Hjertstedt ("Day Keene") was a pretty good writer. When I see his name on a cover I know it'll be a good tale. Wonder why he didn't write under his own name?